The Portland conference is now sold out. Thanks to everyone who has registered, and we look forward to seeing you in Portland in a couple weeks! Now, on to this month’s newsletter, packed with gems we collected from the WTD Slack channel throughout the last 30-ish days. We’re trying something new this month, where we’re highlighting another community and conference that is doing great work. We’re happy to help promote Support Driven, a community built specifically around making customer support the best it can be. They have a Slack channel, newsletter, SUPCONF, and now they’re launching a new event workshop-focused event called SDX. Support lives and dies by it’s documentation. That’s why we’ll have several workshops on documentation at SDX - a new event in Portland that’s focused on learning and applying skills to advance your career. Check SDX out on Kickstarter. This month in WTD Slack, the question arose of how best to handle replaceable content in code snippets – in other words, any situation where we’re prompting users to replace ‘username’ and ‘password’ with, y’know, their username and password. As usual, the discussion resulted in many creative solutions. Choose a formatting convention for any example data, so the replaceable parts of the snippet are easy to pick out visually. Build up a small cast of fictional characters that you can write about throughout your docs. This lets you use a realistic name and password combo that your readers will have some context for. Automate the formatting for replaceable content by defining your own classes. DocBook, for example, will let you do this with the <replaceable> tag, and for Markdown, the same effect can be achieved with some help from hercule and bash scripts. If you’re using fictional characters, you can take it a step further and create actual accounts for them in your system. Then, whenever your real-life users try to execute something with a fictional account’s data, you can throw an error message to prompt them to swap in their actual details. You could also build in a prompt at the top of your docs asking for the relevant details, then use that info to generate personalized code samples that are ready to go, right out of the gate. With this option, there are some authentication and security concerns to address, but Stripe’s API docs are a great example of how this might look. With teams that perform regression testing and user acceptance testing (UAT) after a scheduled sprint, docs are sometimes developed during these post-sprint cycles. In this kind of workflow, docs and testing are often closely allied. Some writers are embedded on Agile dev teams, attend standups, and work on the regular sprint cycle, with stories assigned for doc; others work with parallel sprints, and devs/PMs serve as stakeholders. Some of the “embedded” writers document features at the start of development, but doc is not released until the feature is complete. Other writers find that features change too much during dev cycles for this approach to be worthwhile. Several folks who serve as lone writers wrestle with documenting multiple products or conditional doc sets addressed to different audiences. Some manage by getting developers more involved with helping produce doc content. A question about dividing a complicated data model into clickable sub-parts brought up an interesting secondary question: can screen readers parse .svg flowcharts? According to one Slack member, probably not. She explained, screen readers tend to go top-to-bottom, left-to-right, reading all the words and links. They can also read alphabetically by first letter and hierarchical by H1, H2, H3. But more complex stuff (like reading SVG flowcharts) is probably beyond the capability of common screen readers. For complex flowcharts, consider offering a text explanation along with the image. If you’re interested in improving doc accessibility, check out @susanf’s list of accessibility resources. For an alt-text-centered guide, try Allen Flavell’s article, Use of ALT texts in IMGs. Place whiteboards or large flipcharts throughout the room. Write a complex or unclear sentence at the top of each whiteboard. Assign one group of participants per whiteboard. Give the groups 5 minutes to write a simpler, easier-to-understand version of the sentence on the whiteboard. After 5 minutes, rotate the groups and have them try the next sentence. The groups will learn from reading each other’s revisions as they rotate around to each whiteboard. Then, when all groups have tried every sentence, you can sit down together and talk about how each revision improves the complex sentence. Did we mention that Write the Docs Prague is coming down the pike? We just announced the call for proposals. There are a few changes this year, so check it out and submit your proposal! You have until midnight CET on May 31. And with Slack magic, the message will be copied into a special channel of suggestions. We look forward to reading your suggestions! 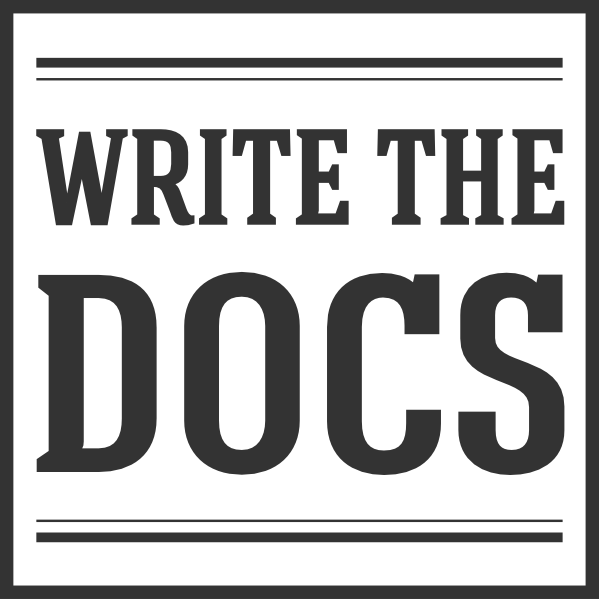 Announcing Full Schedule and Social Events Welcome to Write the Docs Portland 2017!